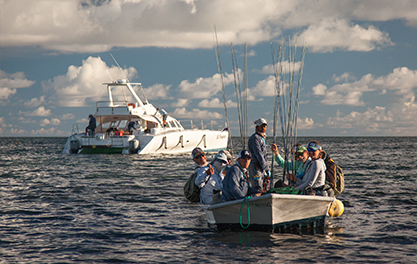 With several new boats and staff arriving on Alphonse the eighteenth week of the season was set to be a busy one. 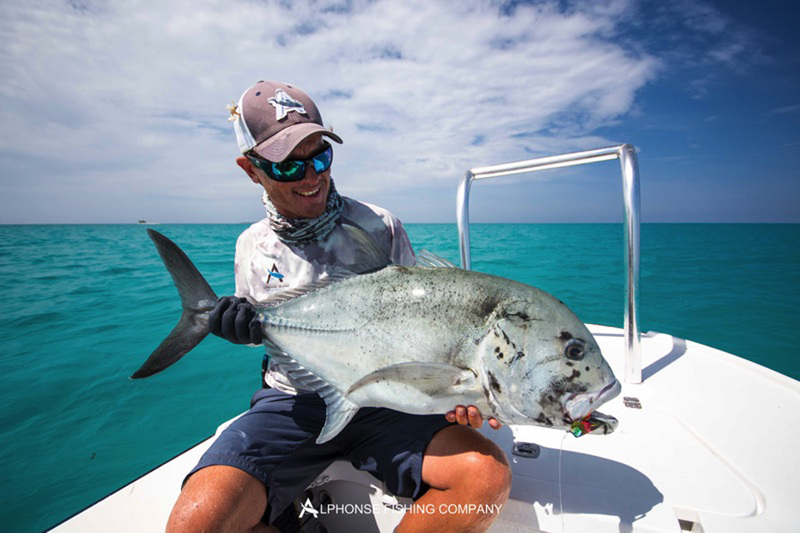 The Milk fish project (MFP) is in full swing and the first Alphonse Billfish bonanza taking place everything was shaping up for a very fishy week. The group of anglers was made up of a small group of return guests and with only eight anglers on the flats the guides were excited to do some long walks and see some of the harder to reach spots. Big full moon spring tides meant that most of the time would be spent around the outer edges of the atoll in the surf. The conditions turned out to be phenomenal, with a tropical cyclone a few hundred kilometres south of us there was a little concern but fortunately it dissipated and didn’t have much impact. With only one day of really windy conditions hampering the fishing the rest of the week was full of bright sun and great water conditions. This all lead to some amazing fishing and some great catches. The trigger fishing was once again really good; we ended the week with a total of 6 triggerfish. Brett O’connor and Dave Hirsch were the first to join this club, both with gorgeous Moustache triggerfish caught in the surf. Next, Ty Pollock and Ian Hodge followed suite with a quality Yellow margin for Ian and a good Moustache for Ty. 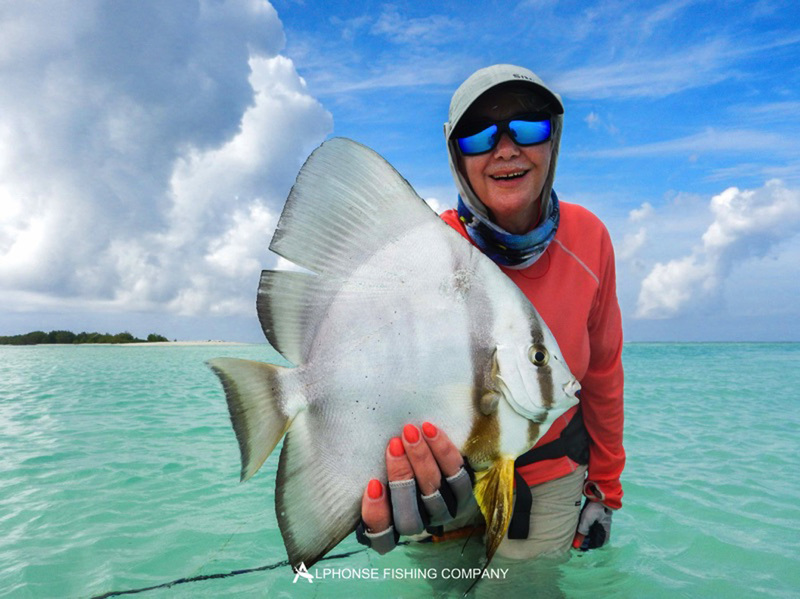 Finally, Tosh Brown managed to tick his triggerfish box in injury time by landing his first Moustache trigger fish right at the end of the week. The flats continued to produce some great bonefish with a few new members added to the over 20 club. Not only were the usual suspects caught this week but some weird and wonderful fish were also convinced to eat a fly. 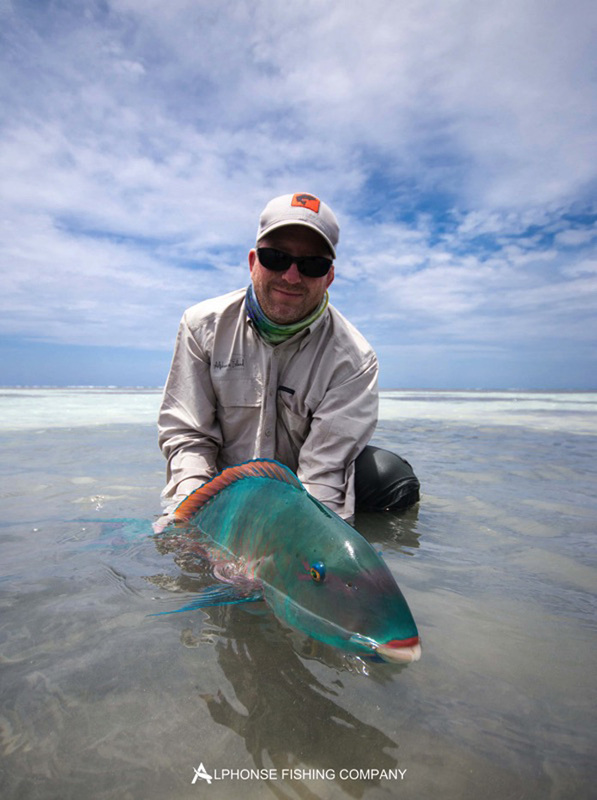 Dave managed to get his hands on a gorgeous Emerald-scaled parrotfish. What was even more notable about this fish is that the fly was perfectly in the scissors of his mouth. 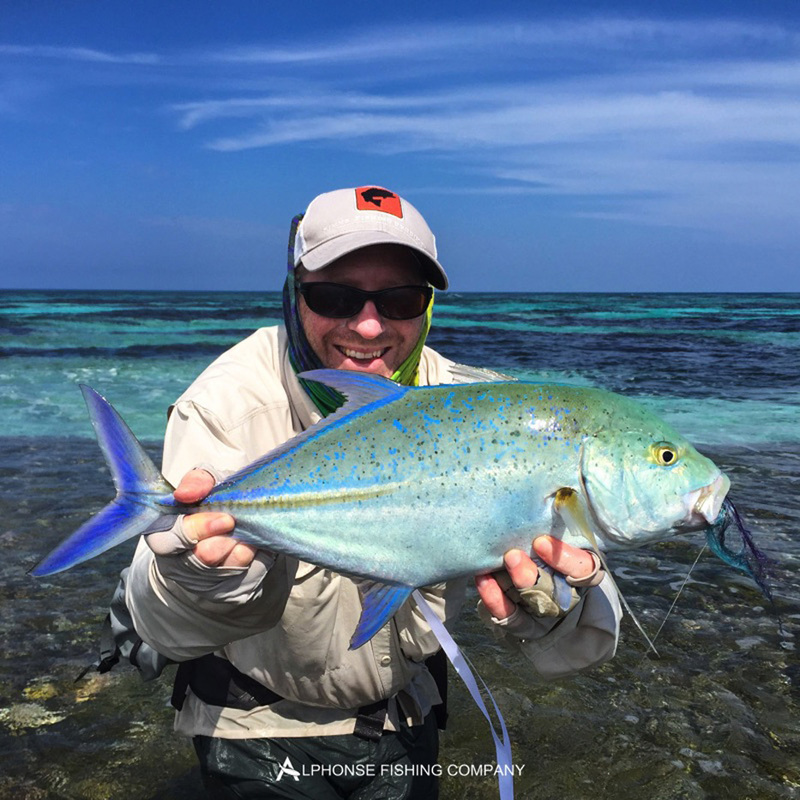 Dave then went on to land the absolute Holy Grail on fly a beautiful Indo-Pacific Permit. A big fish as well, estimated in the 12-15lb range. 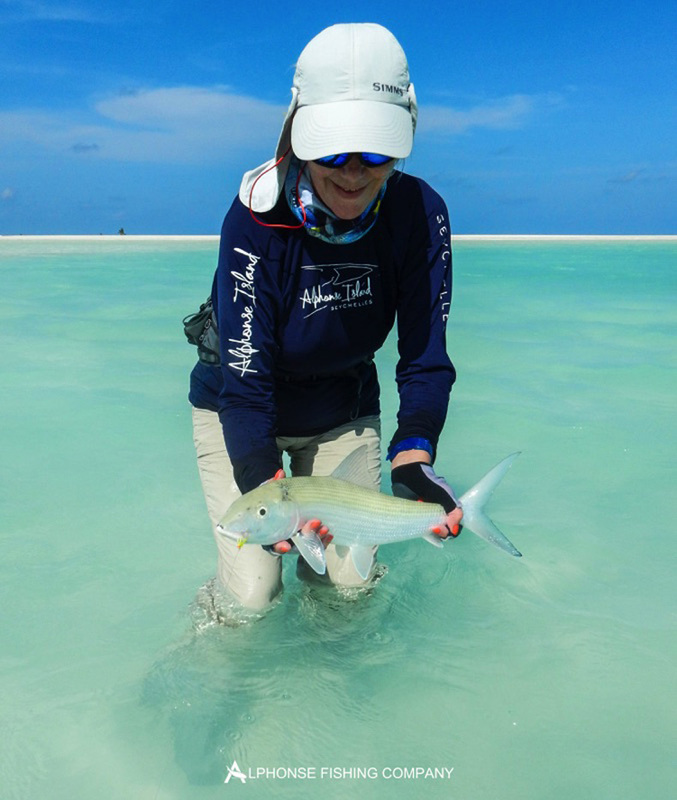 A special mention needs to go out to Waltraud Hason, our only lady angler this week on her first full week fishing the flats. 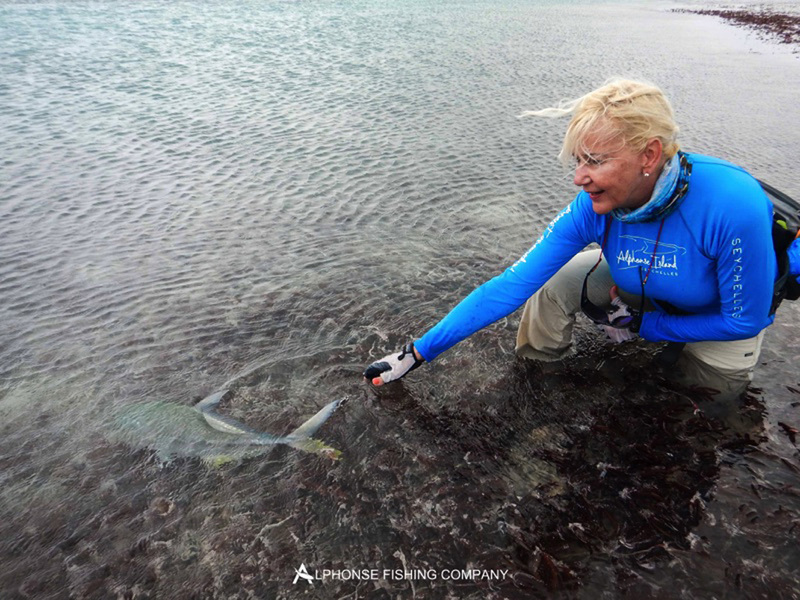 She had an incredible week, lots and lots of bonefish, some beautiful fish over the edge but most importantly she was the champion of our first Alphonse fishing Billfish Bonanza. 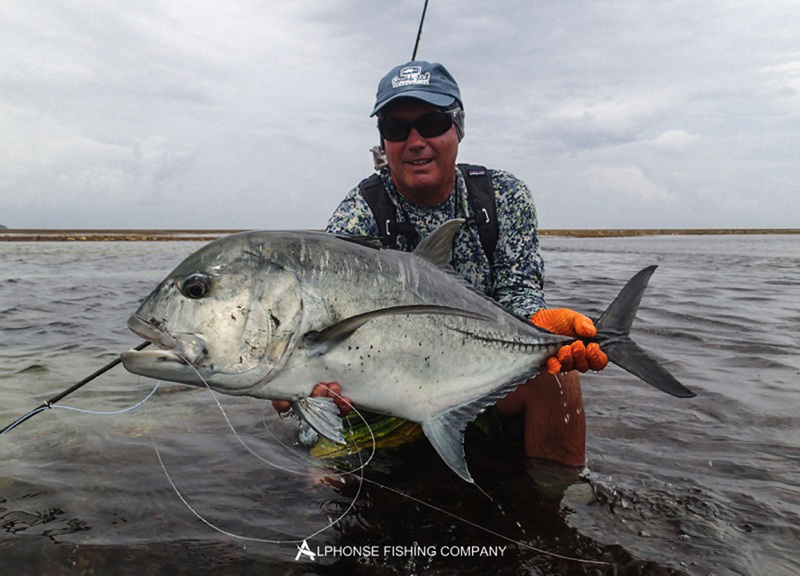 The blue water fishery around Alphonse is a resource that from a fly fishing perspective has only been scratched on the surface. With the new boats and tackle that have just arrived the guides are set up to tackle anything the big open blue has to offer. 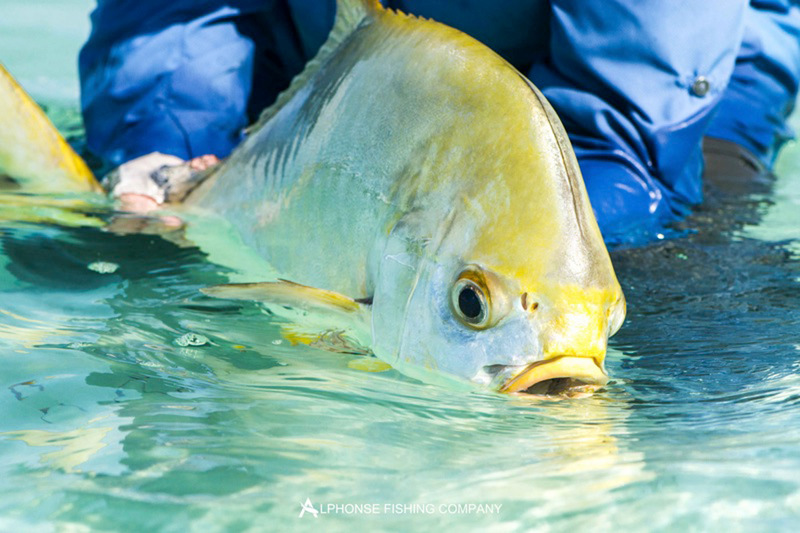 To celebrate this we decided to offer a small friendly competition to our guests with some nice Alphonse Fishing co. merchandise up for grabs. With egos and reputations on the line Waltraud put all the men in their place and came away as our champion. This week was also the first week of the Milkfish project. 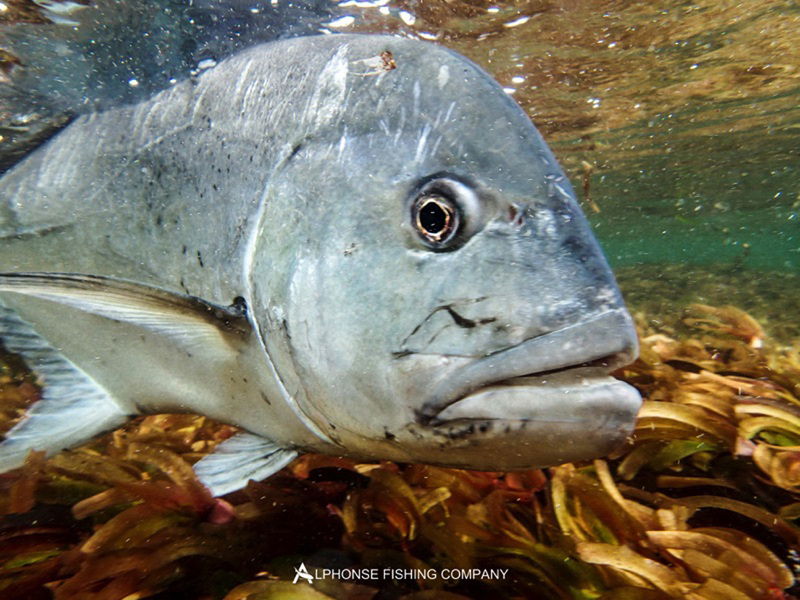 This is a project where the guide team are spending time and setting aside resources to figure these fish out on the flats. 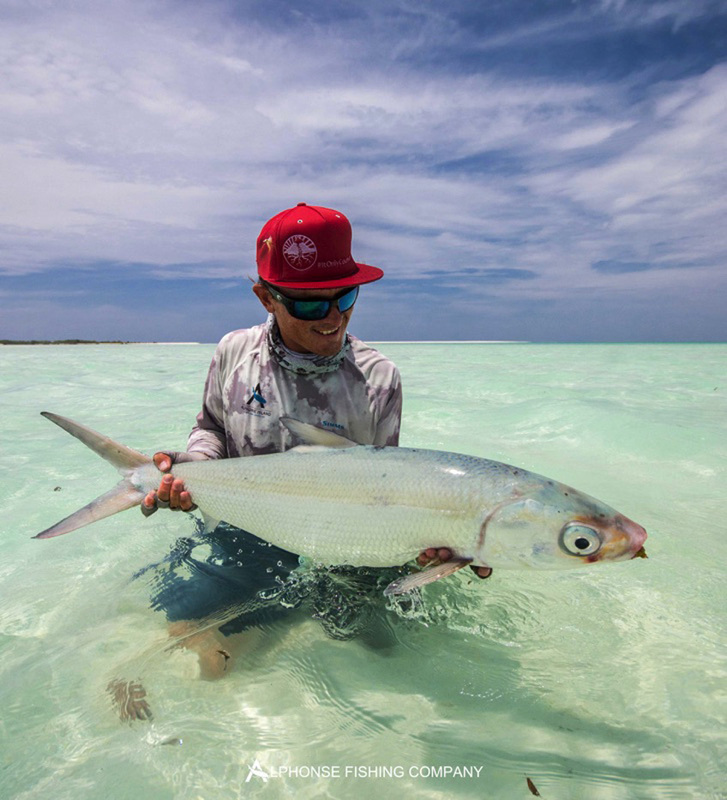 Putting a pair of fish hungry guides on the flats every day with the mandate to ‘make it happen’, it’s only a matter of time until we are jumping these fish daily. 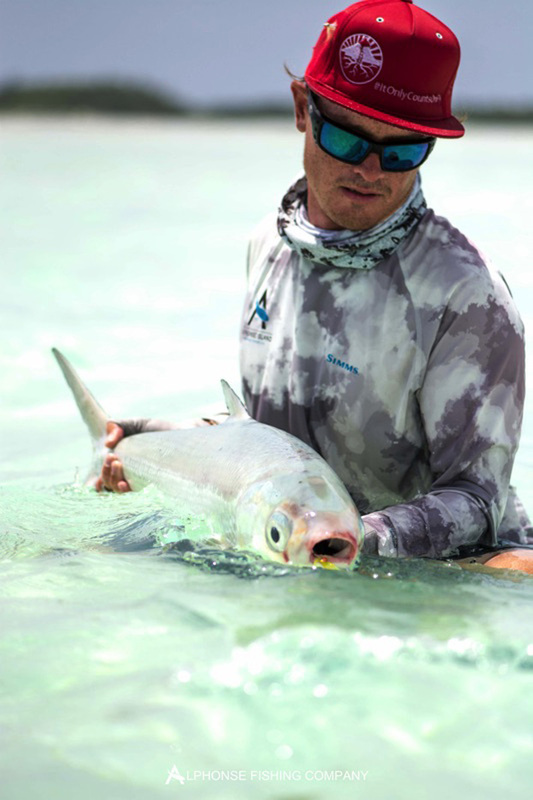 With huge numbers seen on the flats this week, loads thrown at, many hooked, one or two jumped and one fish landed we are slowly starting to get reactions from this elusive fish on the flats. It will happen. We are just over half way through our season, stay tuned for updates on our MFP and some up and coming events.